Although Darvico’s Yanbu branch was operational since 2007, it has now moved to the new fully air-conditioned 15,000 sq ft facility outfitted with sophisticated valve manufacturing machines and equipment including test benches and a huge stock of spare parts. With qualified manpower to take care of their customer’s requirements for spare parts, servicing of valves, handling of shut down, Darvico draws upon leading expertise to deliver exceptional service. 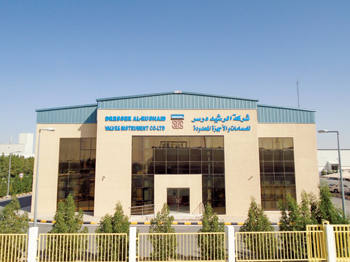 Darvico is a joint venture between Saudi Arabia’s Al Rushaid Petroleum Investment Company and Dresser International (currently part of BHGE), which was established in 1983 with the vision to cater to the requirement of safety and control valves and instruments for the robust industrial development taking place in the kingdom. The company caters to the needs of many industries including oil and gas, water and petrochemical sectors and is an established name in the kingdom. “We are already holding vendor ID as a local manufacturer with Saudi Aramco, Sabic Services, Lubref, Yasref, Samref, Petro Rabigh, SWCC, Rabigh Arabian Water & Electricity Co, Rabigh Power Company and other companies present in the Western Region and we are looking forward to meet their needs with full force and dedication,” said D R Pai, general manager of Darvico. Pai further added that Darvico is fully committed to implement the Saudi government’s policy of giving job opportunities and training to Saudi nationals. “Darvico’s Yanbu branch has enough strength of trained Saudi staff. Very soon, Saudi women will also join this facility,” he said. The company provides best training and know-how to the staff of the companies who have Darvico’s products with a customised programme for proper handling and maintenance. “Darvico is committed to increase its Saudisation plan,” said Meshary Al Oqaily, the executive director of Darvico. Further, the expertise from international plants of Masoneilan and Consolidated expands Darvico’s ability to provide full range of products and service to Saudi Arabia’s process industry leaders. Darvico has also won appreciation from major petrochemical plants for the outstanding execution and support rendered during successful turnaround. With this expansion in Yanbu and new facilities planned, Darvico is all set to retain number one position in Saudi Arabia.